I was sitting at a table in one of the banquet halls of Sheraton New Orleans Hotel the morning of Wrestlemania. This was my second consecutive year of attending the Mania Moments Breakfast, which annually features mostly legends of the business (sprinkled with a few sort-of-beens who are still dreaming of being legends someday) who enjoy breakfast with fans and relive their favorite moments at WrestleMania. Among the luminaries this year were WWE Hall of Famers Ricky "The Dragon" Steamboat, KoKo B. Ware, and Nikolai Volkov. I wasn't sure who we would get from the random name-draw to sit at our table, but I was hoping it was someone I could have a terrific conversation with. Honestly, I was kind of praying for Steamboat, as he is the only wrestler I've ever been within 10 feet of that rendered me truly star-struck. When his name was called for Table Nine (I was at Table Ten), I swallowed my disappointment and sized up the remaining stars. We got Volkov. When it was apparent that he was having trouble finding our table, I walked over and guided him to his seat. I wasn't sure what kind of conversation we would have at this point, but I was determined to make the most of the experience. See, I grew up viscerally hating this man. As a child of the '80s, I naturally hated all things Soviet Union, and his schtick was singing the Soviet national anthem before every match, which of course riled the crowds up into a boiling fury. I had no idea then that he was only doing that so we could enjoy watching him get destroyed by the babyface. Heck. I had no idea he wasn't even really Soviet. Nikolai turned out to be a very kind and caring man who even tenderly lectured my friend's son on his steady diet of carbs and sugar. He spoke of how he loved being a monster heel that made the crowds demonstratively hate him, but he also spoke of being a loving and dedicated family man all through his travels as a professional wrestler. He stated that he was not a philanderer or steroid abuser during his career, but he also admitted freely that he was beginning down that path very early until one man got ahold of him and straightened him out: Bruno Sammartino. This whole conversation started when I asked Nikolai who his favorite opponent was; he didn't even hesitate. "Bruno Sammartino is the greatest wrestler who ever lived," Nikolai said. "Without him, no one would ever know who I am." Nikolai told of coming to professional wrestling from a background as an Olympic weightlifter. He sheepishly admitted that testing standards in those days were a joke, and that pressure to perform led him to make some choices that he isn't proud of today. After an intial run in Stu Hart's Calgary Stampede Wrestling, he came to the World Wide Wrestling Federation (now WWE), where he soon found himself feuding with Sammartino. This feud changed his life. "I was taking steroids in those days, and Bruno pulled me to the side," Volkov recalled. "He told me to stop doing that s--t and live a healthy life. He said it would ruin my joints and ligaments and I would be crippled later in life if I kept doing it." Volkov, who is 70 years old, swept a hand in the general direction of the other tables in that banquet hall, saying, "Look at some of these guys who can barely walk today. They did the stuff and now look at them. I stopped when Bruno told me to and I can walk just fine!" He pulled out his iPhone, swiped through a few photos, and showed me one of Bruno that was taken recently. The man was still positively jacked at the age of 82, and Nikolai bragged that he was still working out - and doing it clean. I asked how he got the photo, and he proudly stated that he still talked to Bruno every week. 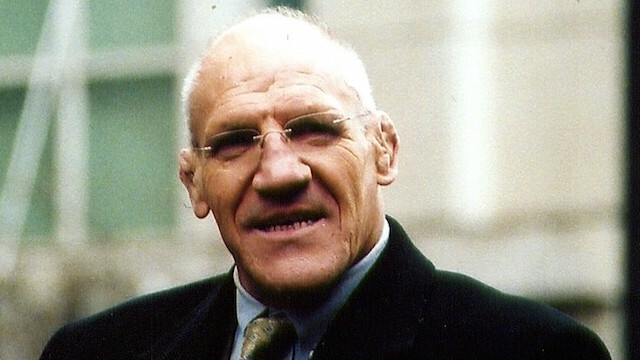 Sammartino, who passed away today, was more than Nikolai's greatest opponent. "He is my best friend!" declared Volkov.